Great fit and style at an unbeatable price. This classic men's shearling coat from Tatto di Pelle features incredibly soft Merino lambskin to give you the highest quality and comfort. Lightweight and chic, this coat is a must-have. The approximate length from the top center back to the hem is 32 inches. The measurement was taken from a size large. this is worth every penny! looks like it was purchased in a designer boutique for ***. great prices from overstock! beautifully stitched and so warm (shearling wool insulates heat so it's like having a personal heater around your body in 20F weather)!! was a gift for my dad who was taking a trip to Alaska. he is exteremly picky about high quality leather. he wears an XL and this black shearling coat was perfection. this "car coat" is 32 inches in length (great for men 5'9" and shorter). overstock offers a longer version 36" in length (for men taller than 5'9") so be careful which version you order. and overstock's customer services is hands down amazing. they helped me exchange the 36" length for the 32" length lightening fast with zero problems. thank you overstock!!!!!!! This coat is EXCELLENT in looks, quality, style and value. I live on the east coat and its a great every day coat from business suits to sweater n jeans. You'll look great and get lots of compliments. When I returned home for Christmas and the weather was frigid, I still kept my warmth without having too layer up. I strongly recommend this coat. Beautiful jacket/coat! My husbund loves it. Light yet very warm. 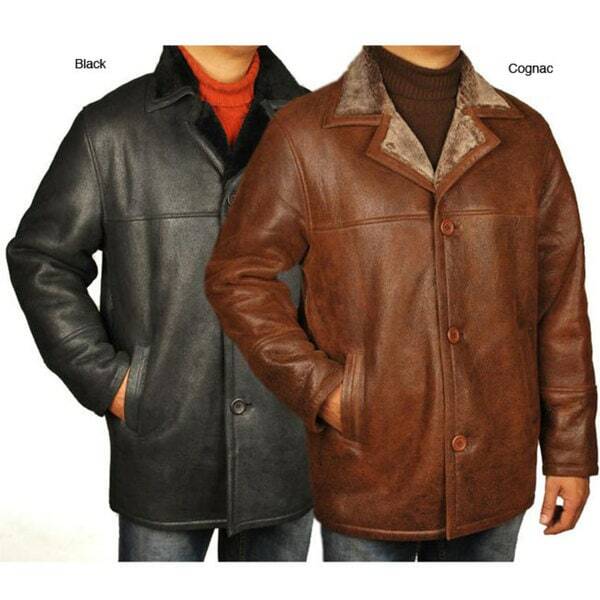 The shearling and leather is so soft to the touch compared to other jacket by famous makers. Would highly recommend this shealing jacket and worth the money. "what is the chest size and sleeve length for the size M jacket?" "What is the actual chest size of the 2XL jacket?" The 2XL jackets have a chest size of 56 inches.